IceCream Soup | Do Orcas Even Have Eyes? 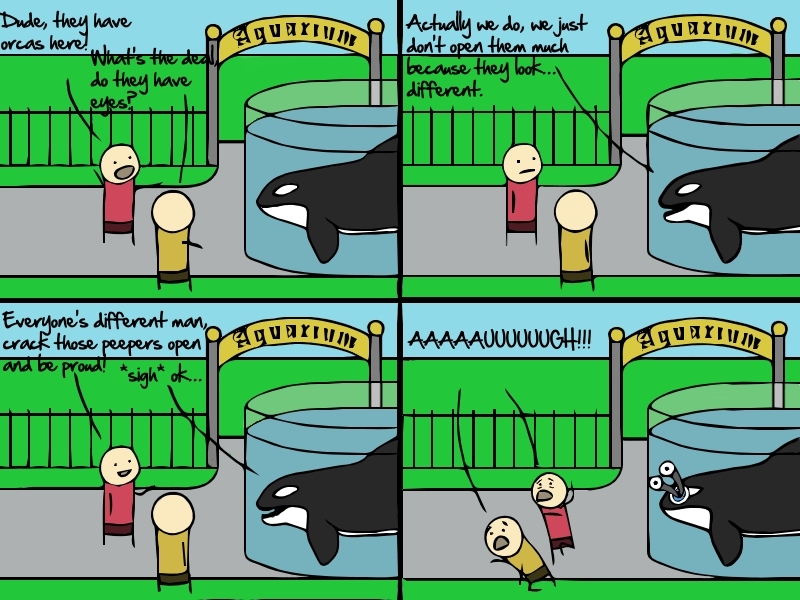 Do Orcas Even Have Eyes? Aaaaaaaaand we're back! Er...I'm back. Sorry for the long break. I'm finally starting to settle in here in Texas. My comics might not always come on their scheduled time anymore but I'll do my best. I'm posting this tonight because I have to be up early tomorrow and I figured I'd just go ahead and get this done now. So anyway...enjoy! was this inspired by the Sea World trainer incident? Oh sweet, you're back! With an aweomely nightmare-inspiring strip! @johlin: I don't think it was directly inspired by that...but I think I heard about the accident on the radio and started thinking about orcas, so it kinda is. AUGH, if I ever had any reason not to be afraid of killer whales I renounce it.